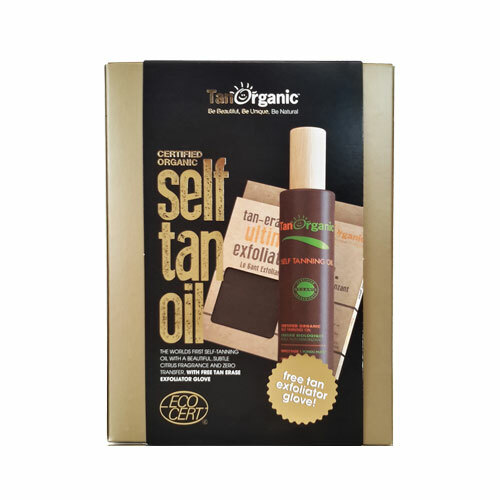 TanOrganic Certified Organic Self Tanning Oil is made with a unique blend of plant oils including Borage seed oil, Argan oil and Orange peel oil. This Self-Tanning Oil has a subtle citrus fragrance and adds a natural bronzed effect to the skin. If you prefer a glow rather than a tan then TanOrganic’s self-tanning oil is the answer to your prayers. It’s lighter than tan but darker than a gradual tanner. It is ideal for those who prefer a natural glow and is the perfect facial tan recently winning the best facial tanner by RSVP magazine. Propanediol, Aqua, Aloe Barbadensis Leaf Juice*, Dihydroxyacetone, Alcohol Denat**, Borago Officinalis (Borage) Seed Oil*, Argania Spinosa Kernal Oil*, Citrus Sinensis (Sweet Orange) Peel Oil*, Gluconolactone & Sodium Benzoate & Calcium Gluconate, Cellulose Gum, Decyl Glucoside, Caramel**, D-Limonene. *Ingredient from organic farming. **Made using organic ingredient. Application couldn`t be easier; you apply a little to the skin as you would any other body oil and massage it in. You DO NOT need to use a glove. TanOrganic’s self-tanning oil does not contain a colour guide so it’s important to cover all areas and make sure you don’t leave any gaps for a streak free tan. Play and practice a little with this application and once you have mastered it, we promise you will love the results. When you are finished, simply remove any excess by wiping the palms of your hands, fingernails and toenails with a baby wipe. TanOrganic’s self-tanning oil takes about 6-8 hours to develop and if you prefer a darker shade, apply another coat to suit your needs. If you like an all year round glow, reapply every 3-4 days as desired. Patch text recommended prior to use. Below are reviews of TanOrganic Self Tan Oil Gift Set by bodykind customers. If you have tried this product we'd love to hear what you think so please leave a review.